Most people do not like to talk about their own deaths. While consideration of these ideas may be uncomfortable, your failure to address these issues could prove costly, as well as emotionally devastating to your family. Whatever your final wishes are, we provide the necessary skill, guidance and assistance needed to ensure that they are accommodated. Your will directs the manner in which your assets are distributed following your death. While state law provides a standard manner of distribution in the absence of a will, the law does not account for your wishes and preferences. There are several ways to draft a will- some simple, some more complex, and the manner in which we proceed is dependent upon several issues. We must first consider the size of your estate. Federal tax law permits tax-free inheritance to a limit. Over that limit, federal estate tax is assessed at rates up to 35%, depending upon the size of your estate. Using time-tested estate planning techniques, we can craft a will that not only takes full advantage of the exemptions provided by the federal government, but may also allow you to exceed those limitations. The second issue we must consider is the age of your beneficiaries. If your children (or other intended beneficiaries) are in their middle ages, you may not think twice about leaving your assets to them directly. However, if they are younger, you may consider creating a trust to maintain those assets until the beneficiaries reach a particular age. This is accomplished through use of a "testamentary trust;" a trust created by your will following your death. A testamentary trust is very flexible. You may have the assets maintained until the beneficiaries reach a particular age, or you might stipulate payouts of your estate over a period of years, allowing your beneficiaries to have some of your assets while the balance is maintained by a Trustee for future distribution. Finally, we consider your representatives. Each will requires an Executor. This person is the administrator of your estate, responsible for payment of your bills and taxes, the probate of your will and distribution of your assets. An Executor will usually hire an attorney and an accountant to assist him or her in the work. If you have created a testamentary trust, you need to appoint a Trustee. This person is responsible for safeguarding, maintaining and distributing trust assets in accordance with your wishes. Finally, if your children are minors, you need to appoint a Guardian, responsible for the care of your children following your death. While the Executor and Trustee may be the same person, the Guardian should not be the same as the Trustee, as there is an inherent conflict of interests. The Trustee is interested in safeguarding the assets and the Guardian is interested in spending the assets. Accordingly, it is a good idea to have separate people act as Trustee and Guardian. It is also a good idea to name successor representatives for each position. This way, if the person named as Executor is not available or not living at the time of your death, there is clear direction as to how you would have wished to proceed. In planning your estate, you should also consider a Living Will/Health Care Proxy, as well as a Durable Power of Attorney. A Living Will provides direction to your health care professionals should the onset of a terminal illness raise questions regarding heroic resuscitation or mechanical sustenance. It also nominates a Health Care Representative who can make medical decisions for you, should you be unable to do so yourself. A Durable Power of Attorney enables a person that you choose to take care of your personal business in the event of your absence or disability. Trusts created during your life are called "inter-vivos' trusts and can be used to maintain and distribute your assets following your death without the need for probate. After creation of the trust, your assets are transferred from your personal name to the name of the trust. In most cases, the creator of the trust, called the Grantor, will be the Trustee, until his or her death. At that time, the trust directs the appointment of a new Trustee, as well as the manner in which the remaining trust assets are to be maintained or distributed. Many people believe that placing your assets into a trust like this will shield assets from Medicaid in the event of a catastrophic illness. This is not true, for several reasons. First, if the Grantor is the Trustee, and he or she has the ability to utilize, transfer, or otherwise manipulate trust assets, the trust will be deemed part of the Grantor's personal assets for Medicaid purposes. Therefore, to be shielded from Medicaid, the Grantor must totally alienate him or herself from these assets. A different person must act as Trustee- the Grantor may not receive any benefit whatsoever from the trust or its assets, and the Grantor may not have the ability to take the assets back from the trust. The Grantor must, for all intents and purposes, give up all rights to the trust and it's assets, irrevocably. Second, any assets transferred to a trust will be deemed the Grantor's own property for Medicaid purposes until five years have passed since the transfer. In other words, if you transfer property to an irrevocable trust, you must wait five years from the time of transfer before Medicaid will be prevented from attaching these assets. If you are willing to irrevocably transfer your assets to a trust, however, there are significant estate planning benefits to be realized. Any assets in an irrevocable trust at the time of your death are excluded from your estate for estate tax purposes, as is any growth in those assets realized since the time of the transfer. This is particularly useful for use with corporate stock that has the capacity to increase in value significantly. As there are significant tax ramifications to trust utilization, it is strongly suggested that an attorney and an accountant be consulted before assets are irrevocably transferred. 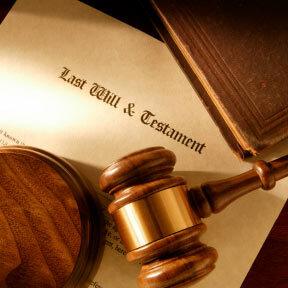 Whether or not your loved one left a will, there is usually a need to settle his or her affairs. If there was a will, the Executor should take the will to the County Surrogate to probate the will. If there was no will, family members should choose a representative to make application to be appointed as Administrator of the Estate. Either procedure requires an appearance before the County Surrogate. As stated above, most times, the estate representative will hire an attorney to handle the various proceedings on his or her behalf. We will assist you in your appearances before the Surrogate, arrange for tax identification numbers, transfer and distribute assets, prepare all necessary filings and settle all aspects of the estate, all billed on an hourly basis. If you would like more information or a cost estimate, please call us for a free consultation.